Matt Fulks is the author/coauthor of more than 20 books. Jeff Montgomery pitched 13 years in the major leagues, 12 of which for the Royals. Since his retirement, Montgomery, who was inducted into the Royals Hall of Fame in 2003, has been a television broadcaster on FOX Sports Kansas City and is a Vice President for Union Broadcasting. 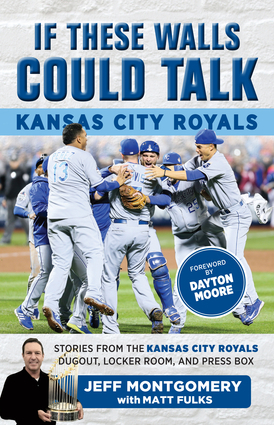 Dayton Moore is the sixth general manager in Royals history and guided Kansas City to the 2015 World Series title. Their 2015 World Series Championship put the Kansas City Royals at the top. But since the Royals’ arrival in Kansas City in 1969, there have been many more moments of unbelievable greatness, heartbreaking defeat and everything in-between. There’s no one better to share these moments than someone who experienced them firsthand. Jeff Montgomery pitched 13 years in the major leagues, 12 of which for the Royals. Since his retirement, Montgomery, who was inducted into the Royals Hall of Fame in 2003, has been a television broadcaster on FOX Sports Kansas City and is a Vice President for Union Broadcasting. Matt Fulks is the author/coauthor of more than 20 books.